Ahead of Sunday nights Horror Watch of The Omen, @Ventspleen2014 looks at why this film is still considered by many to be a masterpiece. 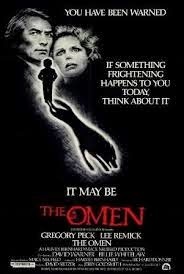 In 1976 The Omen was released to the world and a horror classic was born. The film tells the tale of an American diplomat (Robert Thorn) and his wife (Katherine) and their struggle to hold their very lives together as the true origins of the boy they adopted are revealed. Films detailing the arrival and exploits of the Antichrist (son of the devil) have been the focus of horror films for years. But The Omen stands head and shoulders above the rest for many reasons (unless you happen to be David Warner) Richard Donner directed the film as a love story and the focus is very much on Robert and Katherine. Here we see a couple deeply in love, devoted to each other. It this devotion that leads Robert to hide the death of their legitimate son from his wife and adopt, the expertly placed Damien, instead. Herein lies the films genius. By not opting to film The Omen as your traditional fight against The Devil, Donner brings a real pathos and empathy to his audience. How would you cope if the child whom you loved was actually not human, born of a jackal, and was in fact the Prince of Darkness first choice in the battle against God. Not well I imagine. The scenes in which a disbelieving Robert struggles to come to terms with the events, truth and fall out are expertly portrayed by the legendary actor Gregory Peck. The onscreen couple that is brought to life by Peck and Lee Remick just works. This is a couple who just want to raise a family yet are pawns in Satan's evil plans. Peck and Remick are supported by a now legendary cast. David Warner is tremendous as the doomed photographer Keith Jennings (the scene in which he is decapitated must surely stand in film history) and Patrick Troughton as the cancer ridden and fallen Priest, Father Brenning steals every scene he is in. Indeed, it is Brenning's death that The Omen is famous for. Here to is a wonderful performance by a wonderfully evil Billie Whitelaw as Mrs Baylock. Her introduction to her charge, Damien, is accompanied a wonderfully evil look. Her constant undermining of Robert and her loyalty to Damien are without question. 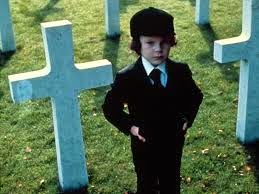 The Omen is more than a film which is held together by dramatic set pieces, don't get me wrong, it has those as well. The death of Damien's nanny by hanging and the way she crashes through the window is a masterpiece of direction and performance. For me, it is The Omen's musical score which underpins the film. Composed by Jerry Goldsmith, the films main theme, Ava Satani must rate at the top of the all time great horror score list. It's haunting latin choral chant of "Sanguis bibimus, corpus edimus, tolle corpus Satani" (ungrammatical Latin for, "We drink the blood, we eat the flesh, raise the body of Satan") interspersed with cries of "Ave Satani" and "Ave Versus Christus" (Hail Satan and Hail Antichrist respectively) It would be worth listening out for the main "love theme" that plays throughout the film. As Damien's evil power reveals itself, this refrain "corrupts" until it muscially slides away as Robert learns of Katherine's death. Such was the success of the film that it went on to spawn three sequels and a remake in 2006. Aside from the fourth part, a derisive cash in mention it not, the original trilogy are rarely far from my DVD player. It is with great pleasure that I request your company in watching this with me. It harks back to an era when films were made with subtlety and with build up of suspense but not at the sacrifice of great character acting. The forthcoming "The Omen" tv series will be worth looking out for as it is reportedly going to focus on the interim years of Damien (I'm guessing somewhere between the events of the second and third film" I will end my appreciation of this horror classic with a clip from the film which is central to its plot, the prophetic poem uttered to Thorn by Father Brennan.